The standard MINIPIX system incorporates single Timepix detector (256 x 256 pixels with pitch of 55 µm) with sensor according to customer preference (standardly 300 µm thick silicon). It uses USB 2.0 interface capable to read up to 30 frames per second (with exposure time of 1 ms). The Timepix detector is energy sensitive which brings a new dimension to radiographic images. The MINIPIX can be equipped with pinhole, coded aperture or X-ray optics. The system can be used in imaging applications (e.g. X-ray or neutron imaging) as well as for radiation monitoring where its ability to recognize individual particles, sort them to several groups (X-rays, electrons, neutrons, alphas etc.) and measure their energies is utilized with great advantage. If more than single detector layer is used then also direction of particles can be determined. 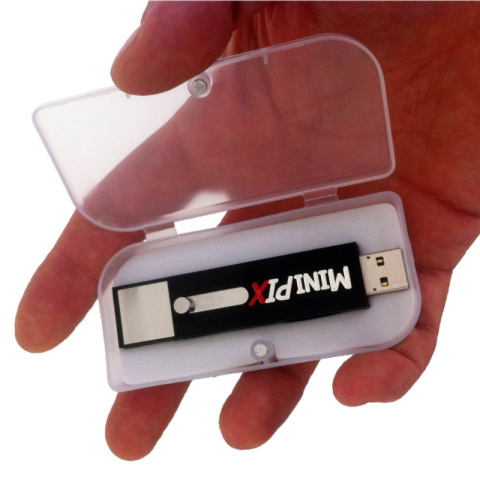 The MINIPIX device is controlled via USB interface. The major operating systems are supported (MS Windows, Mac OS and LINUX). The basic software PIXet lite used for detector operation is provided for free. The complex software Pixelman can be purchased optionally.